American Shorthair cats and it is the only spotted domestic breed selectively bred to "mimic" the cats of the wild. 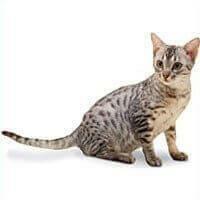 The Ocicat is a large, active animal with a solid and well-muscled body and has a short, tight coat with a glossy satin sheen that shows off its spots. In 1964 the original Ocicat was the unexpected result of an experimental breeding which attempted to produce an Aby-point Siamese, but the ivory kitten with golden spots that appeared was a total surprise - and it was so named because of its resemblance to the ocelot - and so they were immediately loved by all those who saw them, and the breeding was repeated to produce more of these wonderful cats. Never has there been such a concerted effort to breed an entirely domestic cat that can offer the spotted beauty of the wild cats, while maintaining the lovely, predictable disposition of the domestic cat. While the Ocicat looks wild, its temperament is anything but ferocious and it is absolutely devoted to its people. They are quite bright and easily trained. Many will fetch, walk on a leash, respond to voice commands and readily adapt to household rules. Their sociable nature may make them less suited than some other breeds to being left alone for long periods of time, but it does make them a good choice for a household already blessed with other cats or dogs. Though Ocicats fill the need for the exotic, they are easy to keep and require no special care. Their diets are the same as any domestic and their short coats need only the occasional bathing and grooming. They are not prone to any particular health problem and their broad genetic background gives them vigour and vitality.